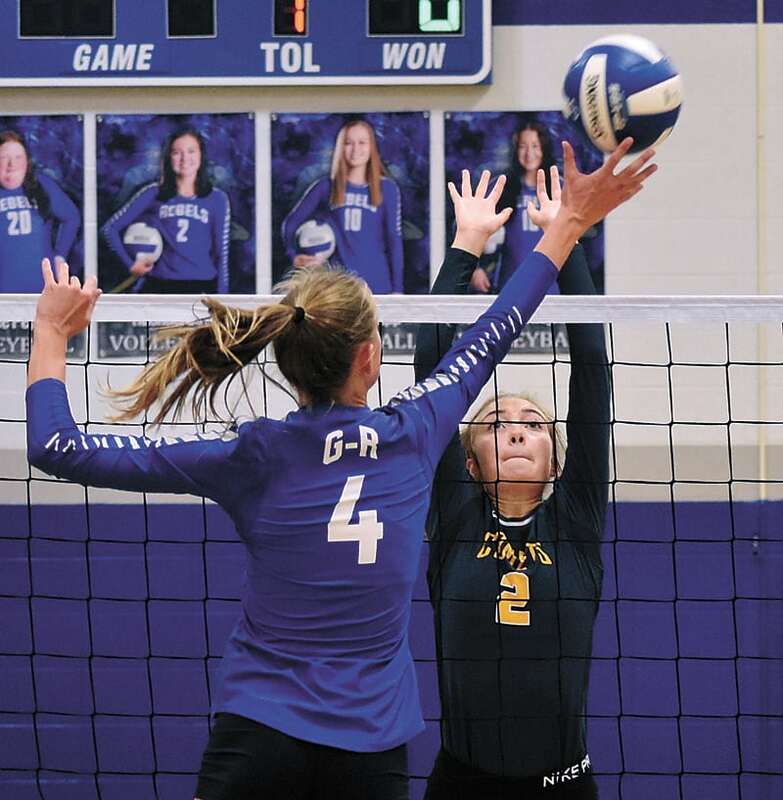 T-R PHOTO BY THORN COMPTON - BCLUW junior Jade Hammers splits Gladbrook-Reinbeck defenders Rachael Scarf (2) and Madison Denny-Weber (12) during the Comets’ straight-set win over the Rebels in their NICL West Division match in Reinbeck on Thursday. 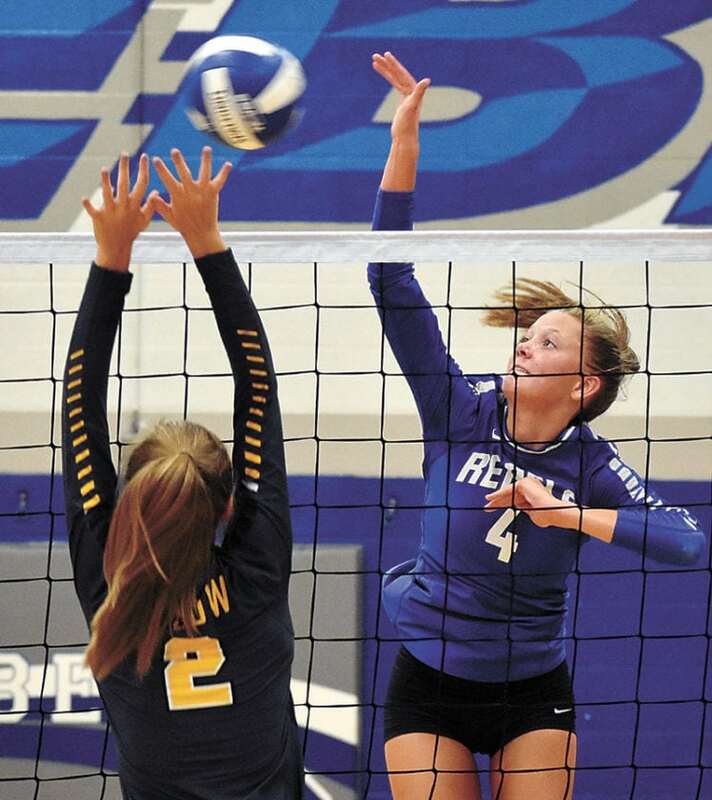 REINBECK — Last season when the BCLUW and Gladbrook-Reinbeck volleyball teams met up in Conrad, the Rebels left with a close five-set, come-from-behind victory. 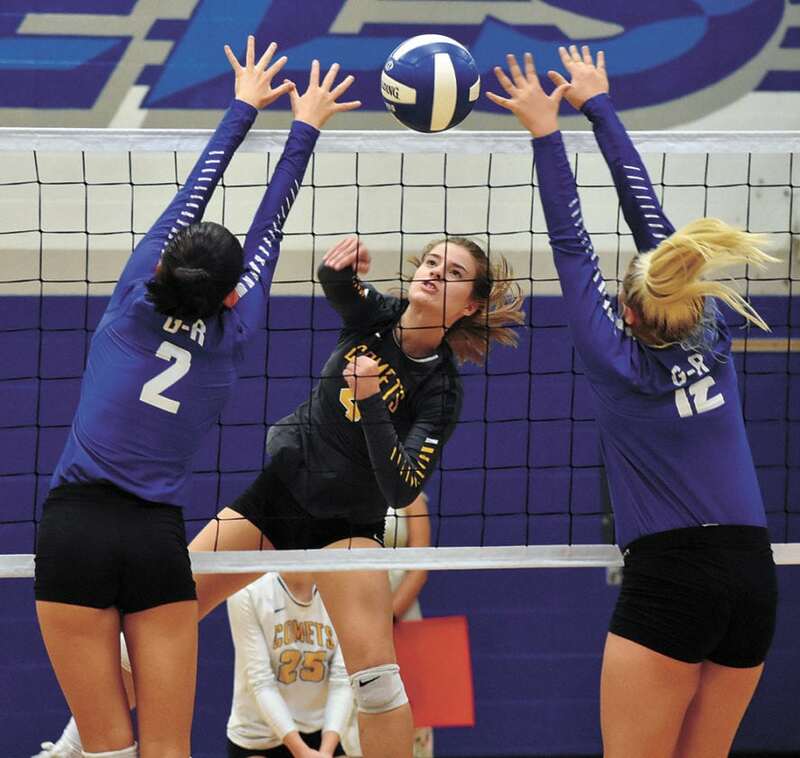 The Comets had revenge on their minds on Thursday night when the two NICL West Division rivals met up for the first time this season, and revenge is just what BCLUW came away with after a three-set sweep with every game decided by the same margin, 25-23, 25-23, 25-23. Comets junior Madi Ubben said handing the Rebels their first division loss of the year was a great feeling. Each set was tied at 23-all, and each time BCLUW (5-2, 1-0) came off of a timeout and won the next two points to take the set. Easton Swanson, the team leader in kills with eight, closed out the first set with an emphatic kill, Ubben scored the point that gave the Comets the lead in the second set, and Jade Hammers came up big with some timely kills late in the third to hand her team the victory. 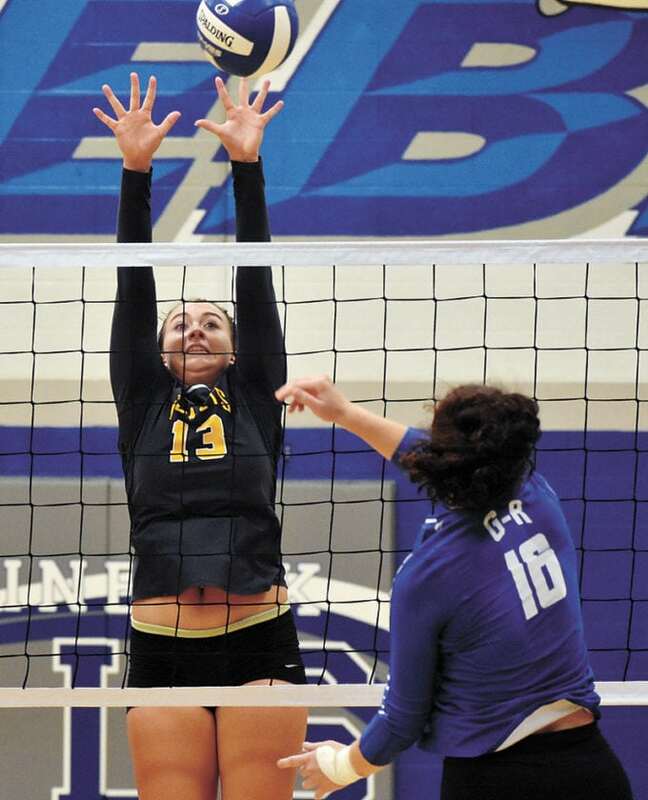 T-R PHOTO BY THORN COMPTON - BCLUW junior Madi Ubben (10) goes up for a hit while Gladbrook-Reinbeck senior Rachael Scarf (2) attempts to block it during the Comets’ straight-set win over the Rebels in Reinbeck on Thursday. Hammers finished just behind Swanson with six kills, while Ubben had four. 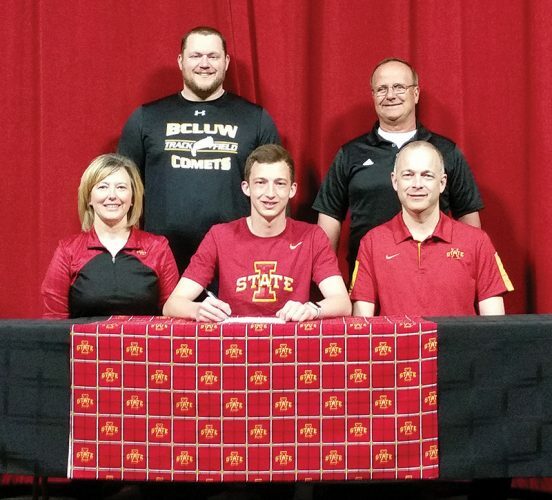 Seven total girls scored at least one kill for the Comets, showing the team’s new well-rounded offense, and the girls didn’t miss a single serve, going 74-for-74 from the back line. While BCLUW got the win, Gladbrook-Reinbeck sophomore Saari Kuehl was easily the most explosive force in the game for both teams. 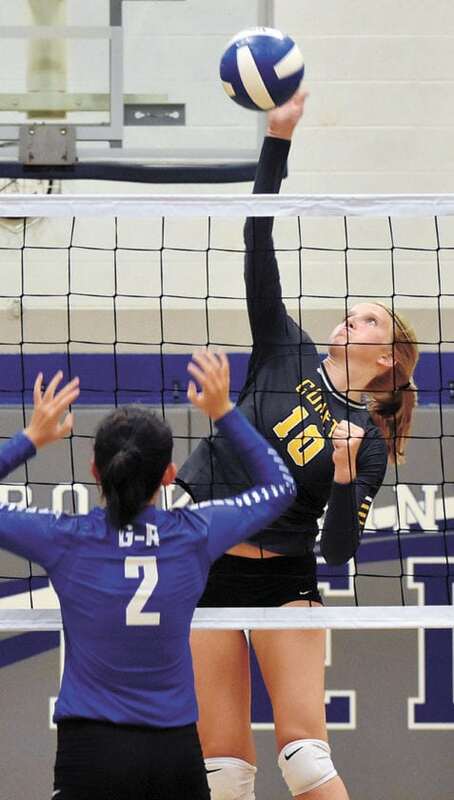 Kuehl led the Rebels with 24 kills on the night, and Garber said her presence was definitely felt. Ubben had the task of following Kueh nearly anywhere she went on the court, which led to four blocks for the Comet junior, though she admitted she had to work for them. Rebels head coach Paula Kelley said Kuehl has developed significantly since her freshman year, a year she still led the team in kills. As for her team losing such a close match, Kelley said she was just happy to give the home crowd a good, close match to cheer during. The match had a little extra meaning than just the first NICL West game of the year for both teams, as the 1988 Gladbrook-Reinbeck state runner-up team was honored before the contest, a team that featured both Garber and Kelley.